I spent the longest time coveting a tart pan. It was the last remaining piece of bakeware I needed to complete my well-stocked kitchen. I'm not sure why I hesitated so long (probably because it meant that I'd need to overcome my fear of tarts), but I recently finally took the plunge and bought one. I made this lemon tart as the perfect ending to the feast Wendy and I made. Successfully making this tart, especially the lemon curd, was so empowering. It almost feels like, if I can make this tart, I can bake anything! Everything about it was divine. The only little snafu was that the crust started to look overcooked towards the end, so I made little foil shields, which then planted themselves in the curd, resulting in a few small blemishes. I need a pie crust shield! 1. Roll the dough out into an 11-inch circle on a lightly floured counter and fit into a 9-inch tart pan with a removable bottom. Set the tart pan on a large plate and freeze the tart shell for 30 minutes. 2. Adjust an oven rack to the middle position and heat the oven to 375F. Set the tart pan on a large baking sheet. Press a double layer of foil into the frozen tart shell and over the edges of the pan, and fill with pie weights. Bake until the tart shell is golden brown and set, about 30 minutes, rotating the baking sheet halfway through baking. 3. Carefully remove the weights and foil and continue to bake the tart shell until it is fully baked and golden, 5-10 minutes longer. Transfer the baking sheet to a wire rack and let the tart shell cool slightly on the baking sheet while making the filling. 4. Whisk the egg yolks and eggs together in a medium saucepan. Whisk in the sugar until combined, then whisk in the lemon zest, lemon juice, and salt. Add the butter and cook over medium-low heat, stirring constantly, until the mixture thickens slightly and registers 170 degrees on an instant-read thermometer, about 5 minutes. Immediately pour the mixture through a fine-mesh strainer into a bowl and stir in the cream. 5. Pour the lemon filling into the warm tart shell. Bake the tart on the baking sheet until the filling is shiny and opaque and the center jiggles slightly when shaken, 10-15 minutes. Let the tart cool completely on the baking sheet, about 1 1/2 hours. To serve, remove the outer metal ring of the tart pan, slide a thin metal spatula between the tart and the tart pan bottom, and carefully slide the tart onto a serving platter or cutting board. 1. Whisk the egg yolk, cream, and vanilla together in a small bowl. Process the flour, sugar, and salt together in a food processor until combined. Scatter the butter pieces over the top and pulse until the mixture resembles coarse cornmeal, about 15 pulses. 2. With the machine running, add the egg mixture through the feed tube and continue to process until the dough just comes together around the processor blade, about 12 seconds. 3. Turn the dough onto a sheet of plastic wrap and flatten into a 6-inch disk. Wrap the dough tightly in plastic wrap and refrigerate for 1 hour. Before rolling the dough out, let it sit on the counter to soften slightly, about 10 minutes. This look heavenly - I love lemony desserts. I want to make this (and I never make desserts), but also want to cheat on the tart crust. For some reason I have an aversion to my rolling pin - in fact, I'm shocked I even known one. I should fly you out to Dallas to help me get over my fear of baking! @Maggie How fun would THAT be?! I was terrified of my rolling pin too until this summer when I had time to practice a lot. I had a bunch of failures, but I'm sure that the practice is what helped me get over it. 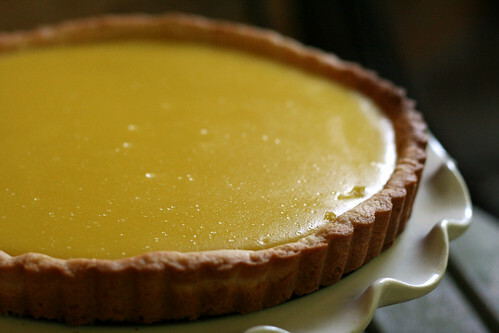 I LOVE lemon curd and lemon curd tarts, yours looks amazing! My favorite things about making tarts is that you can make dough that can be pressed into the pan, I hate rolling dough! I'm still desirous of a tart pan!! Your tart looks lovely! Delicious! I love lemon tarts, lemon curd, lemon bread... lemon anything, really. And I love, love, love tart pans. I have more than I really need (um, four, I think) and am still eyeing more. Have you ever made the no-rolling-required tart dough that David Lebovitz posted earlier this year? It's brilliant, if a bit scary--it comes out tender and buttery every time. oh, lemon curd! I love lemon curd. And it was not as hard to make as I thought, unfortunately. Now I can make it as much as my little heart desires (not great for my waistline!). Great job on your tart, it looks lovely! Congratulations - that tart looks amazing! I've got the fear of tarts, too. I have a pan, but I don't use it.